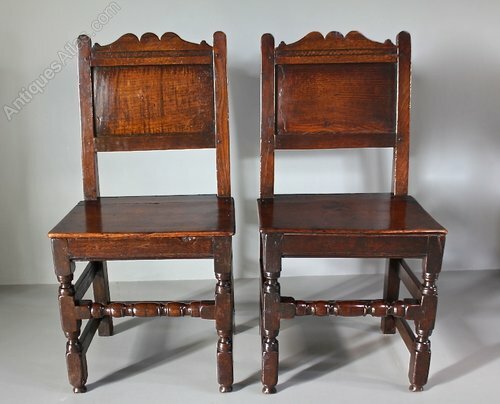 DescriptionPair of 17th century Oak Chairs, with panelled backs and carved shaped top rail. Below the seat is a rail with a simple moulding, and a lovely turned front rail. They have an excellent colour and surface. 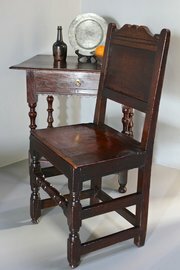 Both chairs are in pleasing condition, with firm pegged joints, but given their age there are repairs. 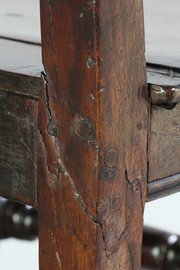 The tips of one cresting rail has been repaired there is a split to the rear of one of the seats one of the back uprights has suffered a fracture but is firm and stable and one of the back panels also has been fractured. (Please see photographs) Circa 1690.